– On the webinar overview in the upper left corner by clicking on the “Add New Webinar” button. This will take you to a new detailed page for your webinar. – The title of your webinar. This title will show on all the webinar pages and notifications. – The description of the webinar. This will show on the registration page. It’s also possible to show this information during the webinar itself and the replay, but you can choose also not to, if you prefer. – The webinar host. Here you can input the name of the webinar host. Are there more presenters, or are you working with a co-host for example? Then you can add multiply names by separating this with comma’s. If you use more than one host name, there will be a new sentence below the webinar subtitle on the front-end. Below the basic information, you will find the webinar URL and the webinar settings if you scroll further down the page. The webinar URL box contains the link to your webinar. You should send this link to your attendees so they can register for your webinar. Make sure to copy/paste this webinar link. 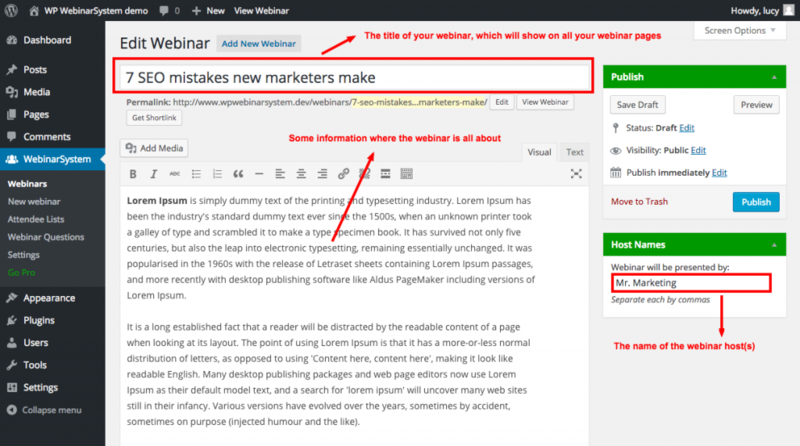 You will be able to view your webinar URL after clicking the "Publish" button. Please note: When saving your webinar as draft, your webinar URL will create a draft link and won't be visible to your visitors. Only use the URL which is shown AFTER publishing your webinar. If you copy other links (which may be specific for the webinar/website administrator) which you may see during the setup of your webinar, the webinar process may not work for your attendees. In the webinar settings box, there are several tabs that represents a webinar page or status. On the first tab, general options, you will define if the webinar is 'Live' or 'automated'. When it's automated, you can select the occurrence: "one time", "recurring" or "Just in Time". When selecting the 'one time' occurrence, the whole webinar process will run automatically (as far as you configure this). Choose your webinar date and time. By default, the Webinar plugin will use the timezone in which your WordPress website is configured in. If you would rather use another timezone for your webinar, then you can adjust the 'timezone annotation'. If you are conducting a 'live' webinar, you have to manually adjust the webinar status. You don't have to do this with a 'one time automated' webinar'. The plugin will adjust the webinar status automatically for you when it's time to go live. Also, you can configure the estimated duration of the webinar. If you want to (temporarily) disable people from registering for your webinar, then turn on the 'disable registration' switch. This will prevent people from registering for the webinar, but they can see the registration page. If you are conducting automated webinars, you don't have to adjust the webinar status. You can leave the webinar status on “Countdown”. The button within the webinar settings will adjust itself to status 'automated' after publishing the webinar. When selecting the 'Recurring' occurrence, the whole webinar process will be run automatically (24/7). Without you even being there, your webinar will run evergreen. If you are conducting a 'live' webinar, you have to manually adjust the webinar status. You don't have to do this with an 'automated recurring' webinar. The plugin will adjust the webinar status automatically for you. To configure this kind of webinar, configure on which days of the week you want the webinar to take place, and the desired time slots. You can also select the "right now" time slot which will redirect your webinar visitor to the webinar page without waiting for the webinar to start. You can only find the "right now" time slot in the first time slot dropdown menu. You can add as many time slots if you like for the webinar to take place. 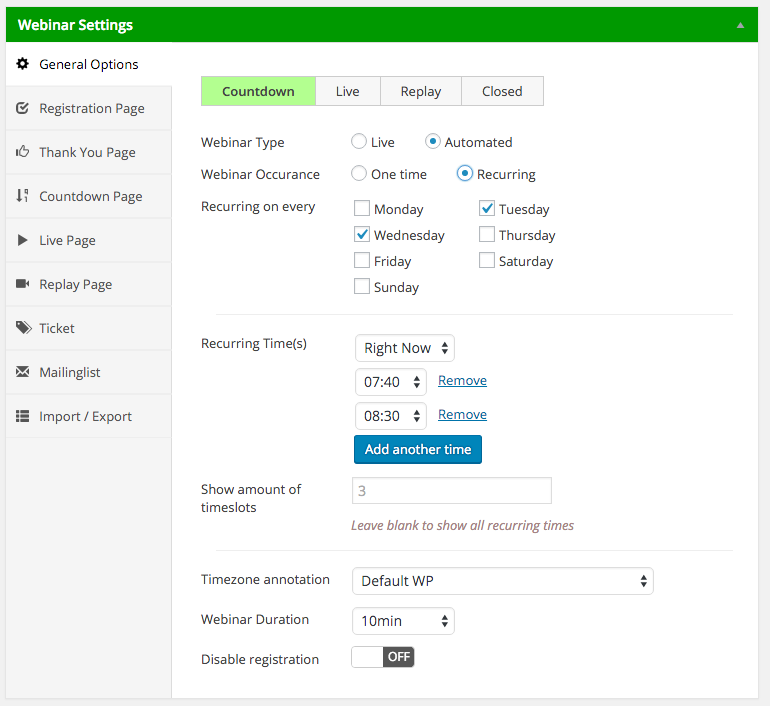 On the "show amount of time slots" field, you can configure how many time slots your webinar visitor will see maximum. By default, the Webinar plugin will use the timezone in which your WordPress website is configured in. 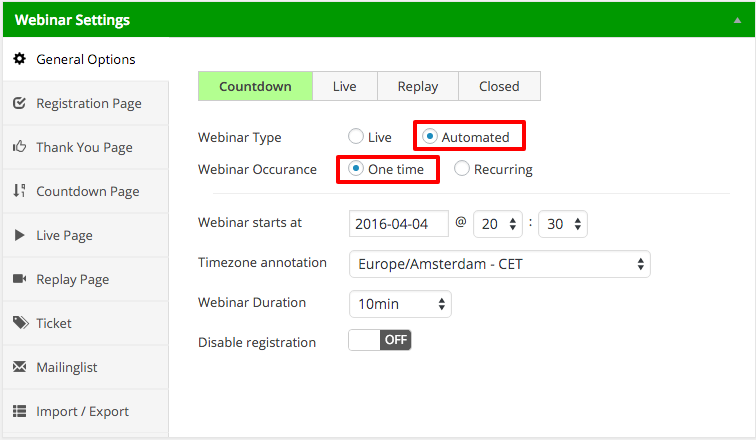 If you would rather use another timezone for your recurring webinars, then you can adjust the 'timezone annotation'. If you want to (temporarily) disable people from registering for your webinar, then turn on the 'disable registration' switch. This will prevent people from registering for the webinar. The webinar status buttons aren't suppose to be used when conducting automated webinars, thats why its best to leave the status on 'countdown' by default. The button within the webinar settings will adjust itself to status 'automated' after publishing the webinar. When the webinar starts, it will show the replay page (because its not live). So if you are setting up your automated webinar, then make sure to configure the 'Replay page' instead of the 'Live page'. If for some reason you want to show the live page for your automated webinar, then you have to set the status on "live". Both will work the same and will be automated, it only shows a different page.